Hosting a successful race doesn't have to be an overwhelming task. 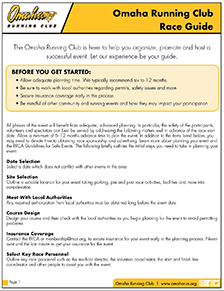 The Omaha Running Club and Road Runner Clubs of America have a number of resources to help you successfully plan, promote and host a local event. Congratulations on taking the leap to plan, promote and put on a great race. One of the best things you can do is start planning early. This will ensure you cover all of the necessary safety, promotional and logistical concerns. Not sure where to start? The Omaha Running Club has you covered. Download our comprehensive Race Director's Checklist. This document outlines the tactical steps necessary to make your event a success. Starting at three or more months out, all the way to race day and beyond; this checklist has you covered. Our Race Guide covers everything you need to know when planning a race -- selecting a date, promoting your event, meeting with local authorities, designing your course and more. This is a great place to start when planning your event. The RRCA has a wealth of information available online to help you successfully promote and plan your event. Their online Race Director's site includes guides for safety, partnering with charities, event insurance and more. One of the first things to recognize is that you are not alone. There are several key services and partners that can help you with necessary race logistics. 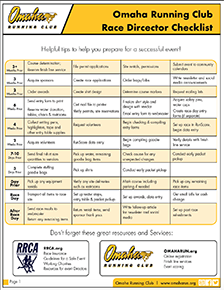 The Omaha Running Club has compiled a few of our favorite resources and tips below. If you are still in need of assistance, please contact us for additional guidance. The Omaha Running Club can help with Online Registration, Finish Line Services, Event Scoring and More. Contact Us today. There are several resources to obtain your bib numbers, safety pins and goodie bags; some of which can even be free. One to consider is an event sponsorship with Road ID. In exchange for including a Road ID brochure in your event goodie bag, Road ID offers event essentials for free or at deep discounts. Most of the water for water stops is donated! Don't be afraid to contact local retailers and water vendors. 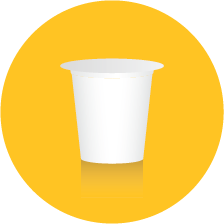 Many will consider donating the water and/or cups in exchange for a sponsorship. Offering benefits like including the vendor on your website, event t-shirt, promotional material or social media posts; is a great way for both organizations to benefit. Precision Race Results is the official timing company for the Omaha Running Club. They use MYLAPS timing technology, which is the most accurate timing technology on the market today. Contact Alan Higley at 402-660-8568 to learn more. There are many options to help your participants celebrate after a big race. Vendor fairs, breakfast feeds and live music are great ways to keep the energy going long after the last runner crosses the finish line. When preparing your race application, consider the size, format and color options. If you plan to mail your application, be sure to verify U.S. Postal Service regulations prior to printing.